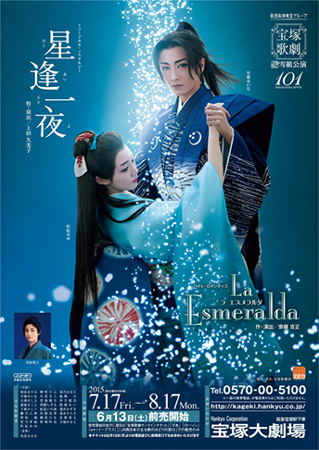 Because of labor laws, ken-1 girls who entered Takarazuka Music School right after junior high could not add the extra rehearsals for the shinjin kouen, and so did not appear in the shinjin kouen. The setting is in the middle of the Edo Period during the reign of Yoshimune Tokugawa. Kinosuke Amano is the second son of the Lord of the Mikazuki clan, based in a lush green village nestled among mountains in Kyushu. He is a free-spirited youth, who slips out of the castle every night and is enchanted by looking at the stars. One summer, on the night of Tanabata (“the Evening of the Seventh”), Kinosuke encounters Sen, a girl from Hotaru Village, and Genta, her friend from childhood. Together, they assemble a turret for observing the stars. From that day onward, Kinosuke, Sen and Genta are friends, transcending social barriers, as they spend long hours every night searching out the stars. Kinosuke and Sen eventually fall in love. However, the time arrives when they must be apart. Kinosuke’s older brother has died suddenly in the clan’s Edo residence, and it is decided he will go to the capital as the clan’s heir. Kinosuke sets out on his journey and leaving behind Sen, without having expressed any of his tender thoughts to her. Having arrived in Edo, he changes his name to Haruoki and becomes the legitimate heir of the Mikazuki clan. The Shogun Yoshimune keenly spots the youth’s talents and enlists him to carry out his own official duties. Haruoki meets with Sen again in his hometown, seven years after the first night they watched the stars together. They are passionately attracted to each other. But she has already decided to marry Genta, who has looked after her since childhood. Meanwhile, Haruoki has received an offer of marriage to Yoshimune’s niece, Takahime. Genta, aware of Sen’s feelings toward Haruoki, keeps his thoughts to himself and asks Haruoki to refuse marriage to a Tokugawa girl. He says he wants to make Sen happy. However, Haruoki could never be expected to permit taking such a road. Yoshimune is moving forward with the Kyoho Reforms. He orders Haruoki, who shortly demonstrates an ability to govern, to take a stern stance toward government affairs. The objective is to rid the country of its financial difficulties so that it can be made stronger. While suffering from a wounded heart, Haruoki starts to undertake reforms of the tax system. Yet these measures put a squeeze on the lives of the common people. Revolts start to erupt throughout the land. The area with the same tendency for insurrection is the Mikazuki domain, where Sen and Genta live. Bad harvests continue. No longer able to endure the sight of young children dying, Genta works on preparations to launch a revolt, over the objections of Sen. Yoshimune learns of this and orders Haruoki to quash the movement in the Mikazuki domain and to administer justice. Then, the revolt breaks out. While bound by his inescapable destiny, Haruoki goes down the path he has chosen for himself. A Latin show that unfolds with a boundless emerald sea in the backdrop, portraying passionate love and many dreams. A romantic stage performance is presented, embellished by rich colors with the theme of “passion,” as personified by Seina Sagiri. Grand Theater debut for playwright and director Ueda Kumiko. Final performance for Konohana Inori, Toumi Sarasa, Hanae Chiho, Yuuto Iriya and Hinazuki Otoha. Sakurara Karan was absent for both the Takarazuka and Tokyo runs. † Maisaki Rin was absent for the Tokyo run due to injury. †† Manazuki Kou retired on the closing night of Takarazuka run without prior announcement. ††† Minazuki Maki retired 2015/10/15 after being announced out on 2015/7/21 due to poor health. Director Ueda Kumiko later won the 23rd Yomiuri Theater Grand Prix Outstanding Director award for this production. Created by caithion. Last Modification: Monday 25 of February, 2019 06:52:09 PST by caithion.